The Significant Other Blogfest was not only a blast, but it also catapulted me across the 600 ‘Like Minded’ followers mark. Yowza!! When I force myself to slow down and really think about it, it’s absolutely mind numbing and humbling at the same time. I realize that a certain percentage of the 618 tiny faces on my sidebar are dead-links, followers who are here in name only. Those are the ones that clicked the button to become a follower (probably in response to me becoming a follower on their blog), but stopped visiting a long time ago. Shame on me for not doing a better job of holding their attention! But those are balanced by readers I know are out there who aren’t registered through Google Friend Connect (like Facebook), and therefore excluded from the 618. Any way you dice it, the size of a small town care what I have to say and are hopefully entertained by my shenanigans. Like most of us, I am not published, I don’t have an agent, and my background carries no expertise that could prove useful in developing our craft. For the most part, I rely on my creativity, inventiveness, dull wit and sharp pen to keep things fresh for all of you…and remain relevant. I vow to continue in that manner for as long as you keep coming by to check on me! You know what reaching a new plateau means though…merriment for one and all! I needed to take a little time to mull over what I wanted to do for this milestone and I believe I’ve come up with something both fitting and different. Let me introduce to you the WHODUNNIT MYSTERY celebration/contest! How is this going to be different? Well, I wanted to design something that would be easy to take part in for those who like it simple, but I also wanted a way to do something that intrinsically represented who I am as a writer. And what do I write? Mysteries! There are three ways to play. First and foremost, anyone participating (at any level) needs to be a follower of this blog here or on Facebook, and leave a comment on this post at either place. That comment will put your name in the hat for a $25 Barnes and Noble gift card to be drawn in two weeks on Sunday Feb. 20th. The other two ways to play will require a little work on your part. I’ve written a special short story, a murder-mystery, that needs solving. In order to solve it, you’ll need clues. Where can you find these clues? Your friends have them…of course. That’s right, thirty-seven of your fellow blogger are hosting a clue on their blog side-bar right now. Which bloggers have them? That’s for you to find out…at least for the first week. During that time you’re on your own to find the clues, using whatever investigative technique you choose. Do you need all 37 clues to solve the mystery? No. A smart cookie could probably figure it out with ten, if they’re the right ten. Some of the clues are rather innocuous and others are critical pieces of information. It’s for you to deduce which is which. You can team up if you wish. Play with a friend, play with a CP, play with your husband or wife who’s always yelling out the name of the guilty party halfway through NCIS. Tell all your friends and spread the word! Anyone who emails me at dlh(dot)hammons(at)gmail(dot)com with the correct solution to the mystery during the first week will have their name entered in a drawing just for mystery solvers, FIVE times. One guess per person. At the start of the second week, I’ll post the names of the 37 blogs hosting the clues. Anyone who emails me the correct solution during the second week will have their name entered in the same drawing, but only ONCE. Also one guess per person. And the winnings if you solve the mystery and your name is pulled out of the hat? A $20 Amazon gift card sent to you every quarter in 2011 (Mar. 1, Jun. 1, Sept. 1, and Dec.1). Talk about the gift that keeps on giving. Are you itching to get started? 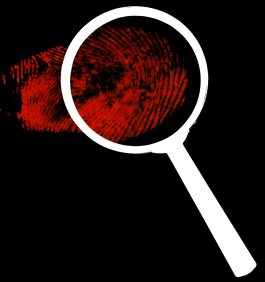 You can find my story by clicking on its aptly entitled name, Whodunnit, but don’t forget to leave your comment below. Thank you again for linking arms with me, and good luck! oh so much fun! I wish I could participate completely. You can put my name in thee drawing but as I read blogs my mobile and on the work computer, I don't see sidebars. Good luck to everyone! Happy hunting! Woohoo!!! I love it!! Looks like I'll be searching for these awesome clues around town. Great idea DL, you're always so creative! I'll probably get started tonight, once I'm home. But I thought I could at least comment for now! I absolutely love this idea! 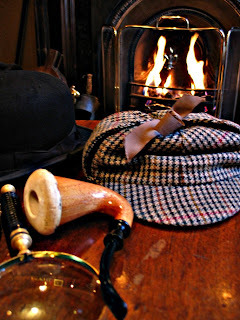 Gonna have to sit down this week and put my sherlock holmes cap on! Now that is a way to celebrate in style! Whoop. Whoop. I love a challenge. Let the mystery-solving begin. . .
Congratulations on having 619 followers! That is amazing. I love how you put it...a small town. I hadn't thought about it that way. WTG! You know how to throw a party DL! Contests on your milestone. This is so. Much. Fun. I'll toss a link in my sidebar in a few. What fun DL. I need to hop around and search when I get a free moment. Doubt whether I can keep up, but I'll make a mental note to try to remember to look for the clues. I've been kind of preoccupied with things here. What a fun idea! And congrats on your 600 followers!!! What a fabulous idea!! And big congrats to you on crossing the 600+ mark. :) Off to read the story now and hopefully I'll get lucky as I visit the rest of my buddies in bloggerland today. Thanks! What a fanastic idea and so creative! I love it! What a blast! Can't wait to get started. And huge congrats on all the like-minded followers!!!! Sounds like a fun way to host a giveaway, DL! Very nice. And so perfect for what you write! Wow, this is really creative! WOW! This is so creative and fun! I'm game! Merriment! Sounds like a blast. Congrats on reaching 600! I'm pulling out my magnifying glass and going in search of clues. What a fun idea! That's awesome! Congrats on your HUGE 600!!! VERY COOL!!! I'm SO in!! What a cool idea for a contest. I'm looking forward to trying to figure things out. First, off to read the story. First off, congrats on reaching such an amazing -and well-deserved- number of followers! Second, this is such an awesomely creative and generous contest. What a great idea! Yay, I'm so excited for this! But, er, what if we email you with the wrong solution? Will we get a second chance? I can't wait to see who else has got clues up! This is the greatest contest! I'll keep my eyes peeled for those clues! This is the best contest ever! It would be great even without the prizes - because I LOVE mysteries. Congrats on the 600 Like Minded - Awesome! Sounds like this is going to be fun. This is a great idea! Can't wait to start! Well I'm a follower of your blog and I'm leaving a comment. That part was easy. Now off to start finding out who those 37 bloggers are with the clues! DL, what a great idea! I'm rubbish at mystery solving, but I'll try to keep up with your clever followers! And what a way to celebrate! Wow- sounds like a lot of fun. Not sure I'll have time to play fully, but I might give it shot just because. I'll read the story as soon as I have time. You are crafty DL and very creative. Have a wonderful day! Congrats on a great milestone. I LOVE this idea!! 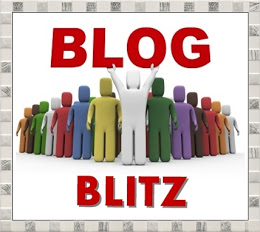 So great to get interactive and send peeps blog hopping. Genius! Hello fellow crusader. Congrats about your 600 count! If I'd known before about the Significant Other, I would've joined in. I love your blog name, Crusing Altitude. My husband built a Vans RV-7 and we fly it all over, whenever we can. What a creative contest! I'll have to keep an eye open for the clues as I make my blogging rounds today. Man, wish I would've known about these clues BEFORE I read and commented on 15 blogs tonight. I prob would've found a couple clues. Searching... searching... summa' those clues are very well hidden. Still, I think I'll give it a try. This is pretty slick, Slick. Wow. What an interesting and inventive idea for a contest. Very clever. Congrats on the followers DL! You are so clever! What a brilliant idea that fits you perfectly! DL, you are such a fun, creative guy! I'm glad to be following you. Sorry, I've been MIA for awhile...working on some of my writing and business projects. Anyway, I'd love to be included in your drawing. I'll do my best to find some clues, too. What a fantastic, fun idea! I'm in! And I had no idea why I'm not already one of your followers! I'm off to read your story. Thanks for the fun! I'm late showing up, but I hope to get a good start tonight. A very cool idea DL. The story was excellent. I think I know which clues are important . .
You have really thrown out the gauntlet now. I guess it is time to roll up my sleeves and get to work searching for clues. Great idea! Eeek! I almost missed it. I LOVE a good mystery and pledge to do my best to solve it over the next two days. Congrats on the big 600! Quite an accomplishment. Sounds like you have a ton of fun ideas. Isn't it funny how down on ourselves we can get about comments and readers? You come up with the greatest ideas! Love this!